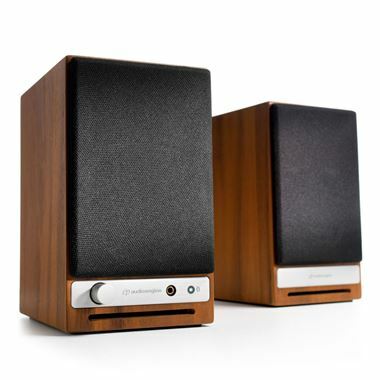 Audioengine HD3 Powered Bluetooth Speakers. Available with Online Finance and Free Delivery. The AudioEngine HD Series were designed to suit the various ways people listen to music today, including streaming wirelessly, digital downloads, vinyl, and more. The HD3 sets a new standard for compact mini music systems because of its versatility and ability to play all of your music from any device. Connect to HD3 any way you like: wirelessly or wired, digital or analog. Stream your music library, TIDAL, Spotify, Pandora, YouTube, etc. to HD3 from just about anywhere in your house without dropouts. Wireless setup is a breeze and only takes about a minute. And if you’re using HD3 on your desktop, connect up with a USB cable. The USB input bypasses your computer’s built-in low-quality headphone jack for a high-end listening experience. But if you’re not keen on USB or wireless you can still use any audio cable to connect. Easy setup, simple and useful features, and wide stereo sound make HD3 your go-to music system. HD3 is expandable, so if you want deeper bass just connect up your subwoofer. No matter how you listen to music, HD3 has you covered. HD3 includes a dedicated high-performance headphone output so you can listen and not wake the neighbors. Its audiophile-quality headphone amplifier delivers high-end sound that drives even the most-demanding headphones. HD3 was designed for audio performance, but speakers obviously also need to look good so we’ve included furniture-grade wood veneers, aluminum trim accents, and detachable magnetic grills that blend with any decor. Available in Satin Black as well as real Walnut and Cherry wood at no additional cost if you want to really show them off. Built-in power amplifiers save space and eliminate the need to connect HD3 to a stereo receiver or external power amp. Simply plug the left speaker into a power outlet and connect the included speaker wire from the left to the right speaker. All internal components of the HD3 are designed and tuned together, so you’ll get Audioengine’s Signature Sound and a much more efficient system than traditional separate speakers and amplifier.